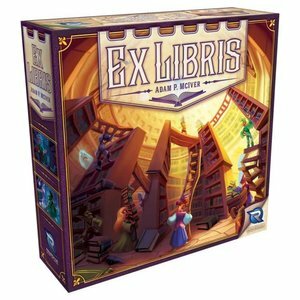 The perfect game for all of bibliophiles out there, Ex Libris is a 1-4 player game for ages 10 and up! In Ex Libris, you are a collector of rare and valuable books in a thriving fantasy town. The Mayor has just announced a new seat in the Village Council, Grand Librarian. The prestigious and lucrative position will be awarded to the citizen with the most extraordinary library! Unfortunately, several of your book collector colleagues (more like acquaintances, really) are also candidates. To outshine your competition, you`ll need to expand your personal library by sending your trusty assistants out into the village to find the most impressive tomes. Sources for the finest books are scarce, so you`ll need to beat your opponents to them when they pop up - especially if they match your library`s secret focus! You`ll need shrewd planning, cunning tactics, and perhaps a little magic to surpass your opponents and become Grand Librarian!